With six kids, meals are something I like to keep a tight control over. By menu planning, I can really keep costs down. But it's not just about the costs, it's about controlling the chaos. And there are some nights, that despite careful planning, the chaos starts to take over...that's when I like to turn to back up plans. 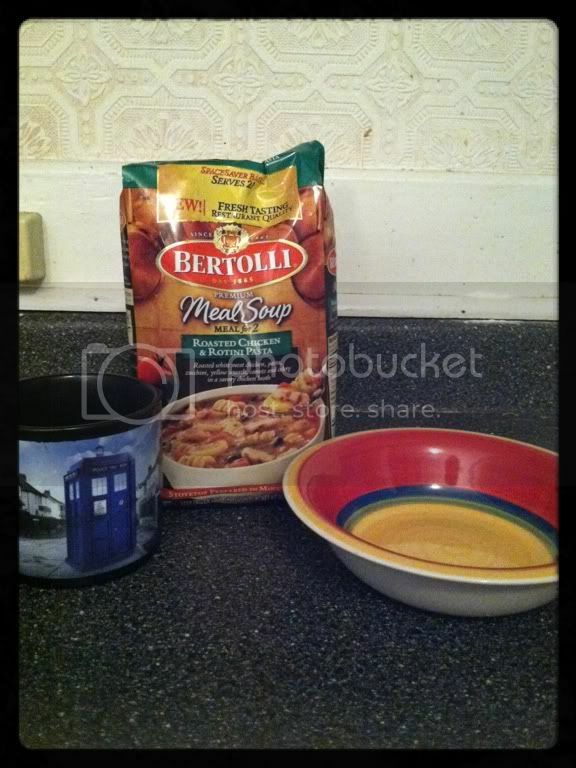 When I was contacted about trying the new Bertolli Meal Soups, I was very excited. I am a big fan of soup, but it's not something I get to use as a dinner very often because D doesn't like it. The new Bertolli Meal Soups come in four varieties: Chicken Minestrone, Roasted Chicken & Rotini Pasta, Tomato Florentine & Tortellini with Chicken, and Tuscan-Style Beef with Vegetables, all of which sounded super yummy to me. Meals for two don't go very far in a house of 8, but that meant this was going to be a rescue meal for me...for one of those Calgon, take me away sort of nights. As dumb luck would have it, that chaos night came a lot sooner than I expected. The day started at 5 am with Little Miss and her puking alarm clock. D called in sick to work because The Boy had a doctor appointment and I couldn't take Princess Pukesalot. Oh, and I had to take Steve, our new rescued kitteh in for his neutering appointment. It was already shaping up to be an oh-so-fabulous day. The Boy is on the autism spectrum and most of the time he does really well. Today, not so much. He had to get blood work done. It took a valium (for him, not me...though by the end of the appointment, that was starting to sound really awesome) and four nurses to hold him down. The appointment was at 10 am and we didn't get home til just about 3. I had to pick up Danger Girl from school at 330. I had a few minutes before I had to run to pick up Little B from school, race over to get Steve from the vet, run back home...and it's after 5. The Boy is still feeling really off thanks to the valium. Leelee is supposed to be at the Food Bank at 615. Little B and Danger Girl at the church at 630. Somewhere in there, I'm supposed to prep dinner, make sure homework is done and...not go stark raving mad. I threw a quick meal together for the kids, but I really just needed something for ME. Time for some Bertolli Roasted Chicken & Rotini Pasta. The first step for making this mealtime special for me was making sure I didn't have to put in a ton of effort. I spent the whole day giving to everyone else, I didn't want to spend a ton of time in the kitchen. This was done in less than 10 minutes, including my dessert! 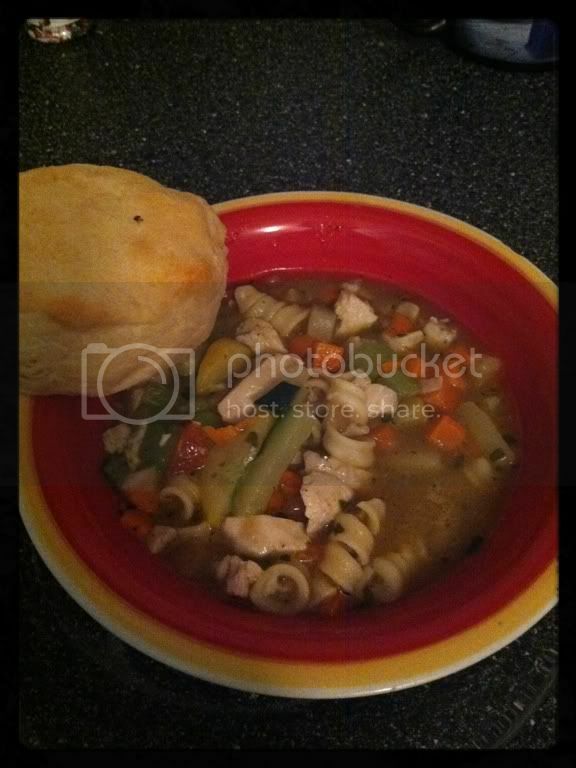 What I noticed right away about this soup was the amount of veggies. So many soups lack in the veggie department. And because the soup was frozen, the veggies weren't overcooked and mushy. My second step to making a quick weeknight meal special is to choose special ingredients. This time of year, that means picking up an out of season treat. The strawberries in Florida are arriving in the stores now. It's the perfect first step for dessert. I hulled the berries them stuffed them with chunks of chocolate. 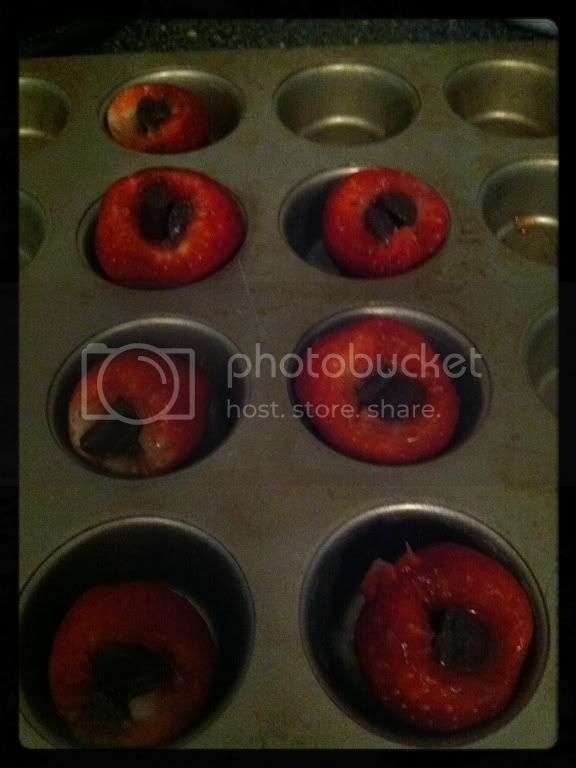 Then, roasted them in a 350 degree oven for about 5 minutes. Melt in your mouth Inside Out Roasted Chocolate Strawberries. I was a good girl and ate the delicious bowl of soup first. Check out the chunks of veggies! You can't get that out of can! I was also a nice mom and shared the strawberries with Punky Brewster. Then I sat down and enjoyed a nice cup cocoa. Just because the dinner went together in a hurry, doesn't mean you have to eat it in a hurry. Taking the time to enjoy the taste of the food is a big part of making dinner special on the weeknights. Want to know more about the Bertolli Meal Soups? I was compensated by Bertolli to participate in the Weeknight Meal Special Challenge. All opinions and thoughts on the product are mine. That dinner looks soooo good! 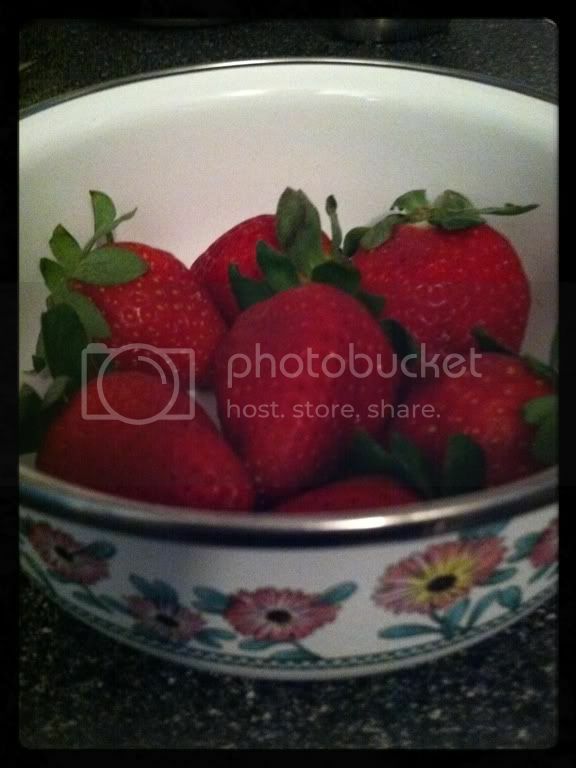 Definitely trying that soup and the inside out strawberries!